The mission of the Mon Valley Regional Chamber of Commerce is to provide a leadership forum for the business community of the Mid Mon Valley region by offering education, networking and advocacy to its membership. Bakery is being recognized in the Mon Valley Regional Chamber Member Spotlight. 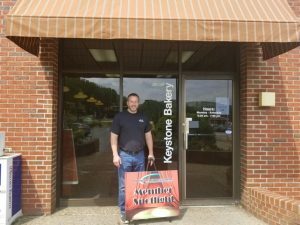 is a locally owned and operated bakery with two locations at 3 Eastgate Plaza in Monessen and 770 Rostraver Road (former K-Mart Plaza), Belle Vernon. The Belle Vernon location is temporarily closed for extensive remodeling and will re-open this summer. Keystone is passionate about living up to its high standards and commitment to each and every customer. These ideals have been at the core of their business since they opened their doors in 1926. Costas Croussouloudis migrated to the United States from Greece and became a partner in the decade old business. John Croussouloudis and his wife Pauline ran the Bakery from 1959 until 2007 at which time his nephew, J.J. Georgagis, took over the business. J.J. and his wife Melissa have been working hard to keep the family business and tradition going strong and striving to exceed customer expectations. Keystone’s reputation has been built on producing their products from scratch daily and are preservative free. The bakers are comprised of nearly 100 years of baking experience as well as the decorators, some of whom have dedicated nearly 50 years to the business. Stop in and pick up your goodies today or learn more about Keystone and their products at www.thekeystonebakery.com, Orders can be placed at (724) 684-8644. Hours of operation at the Monessen Store are Monday-Saturday 6:30AM to 7:00PM and is closed on Sunday. Stayed tuned to the Keystone website and Facebook page for updates on the re-opening of the Belle Vernon store. The MVRCC will be a part of the festivities.